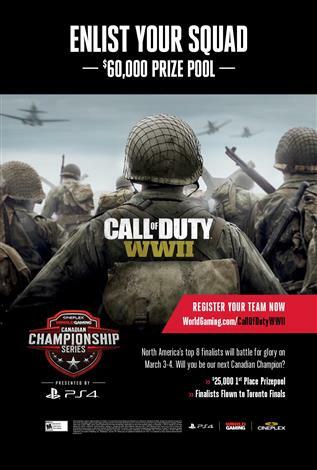 WorldGaming’s Canadian Championship Series, presented by PS4 returns to Toronto on March 3-4 where North America’s Top 8 teams will battle for $60,000 and the Championship title - playing Call of Duty: World War II across two qualifying stages to reach our Live Finals at Cineplex Scotiabank Theatre. Tickets available now! Both the Weekend Pass and Fan Experience tickets are valid for BOTH March 3 and 4. Call of Duty WWII is rated ‘M’ by the ESRB. Therefore, it is strongly recommended that all viewers be 17 years of age or older or be accompanied by parent or guardian to attend.